The Procedure Charges report is an Advanced Report which displays the procedures used in the last 12 months, by note date. This report will show how much was charged, the collectible amount, if a co-pay was applied, if it is covered by insurance, if it is a flat rate, and the global days. The report will look back 12 months from the current date. It will list all CPT codes in numerical order and will pull data from encounters created in the date range. This report has one view, a table view, that displays all information in several tables. Each table represents one CPT code. 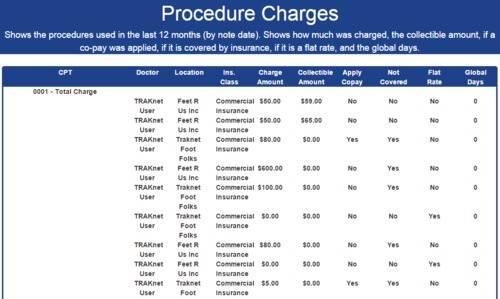 In each CPT code table are the list of which provider billed the code, the Location, the Insurance Class, the Charge Amount, the Collectible Amount, if a co-pay was applied, if it is covered by insurance, if it is a flat rate, and the global days. Treatment Code(s) - Filter the report by certain treatment codes, separated by a comma (with no space) if multiple treatment codes are entered.